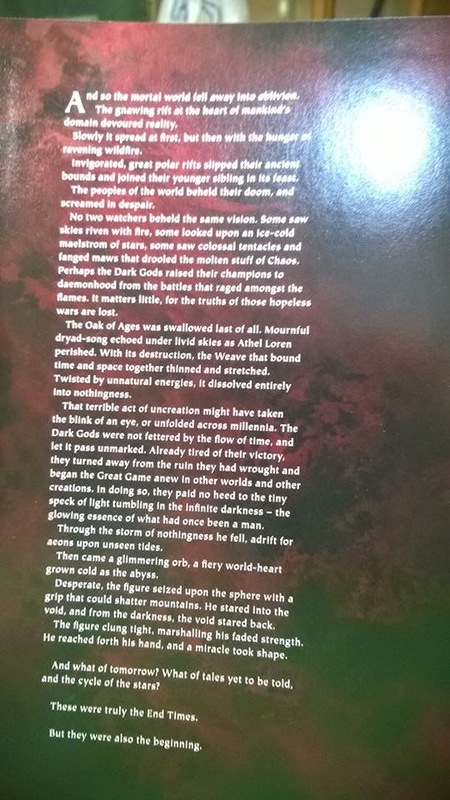 An image of the final paragraph of End Times Archaon popped up this morning, and there were a few issues generated by this that I want to talk about but before I go on fair warning: I will be displaying the image so if you don’t want the book spoiled then turn back, if you don’t mind then read on. For those reading on here is the paragraph for context’s sake. Bottom line is that the Warhammer World is gone, all the races are dead but the Lizardmen (who escaped on earth, space bubble ship things), all the lore in all of our wonderful army books is dead and gone and 9th edition will start (I assume) on a new world. Restarting the setting means that for 9th edition we can assume that whatever the new armies for this new world will look like we can assure that they will be different from what we have now, but not too different that the make the current model range look out of place and force everyone to redo their armies, that would be bad as GW has taken a gamble with this move (wiping out the Warhammer world and starting from scratch)and they need everyone on board for 9th edition to work. There isn’t a lot in that end Paragraph if you are looking for hints on what 9th edition will look like rules wise, it could be Skirmish hammer but I doubt this as, like I said before, GW needs everyone on board for 9th to work. We could see something like the 6th edition book where there were skirmish rules built into the book and placed near the end, giving the option for skirmish game but I doubt that 9th edition will move from large scale armies to small scale Warbands, the rumours be dammed I cant see it happening and if it does then I think it will back fire as lot of people will be annoyed at the WHFB setting being wiped out unless the 9th edition setting is better than what we had. I foresee the ability to play it against 40k. Trying to bolster it financially by including it in their far more successful system. They have seen it work for Warmahordes and will want to emulate it. Also leaks from Archaon reveal that Unbound has now come to fantasy replacing the way you currently make an army. The Unbound Rules seem to be tied to End Times battles in the same way as the magic rules from Khaine, rather than being rules changes for the whole game (like 50% Lords/Heroes was, or Lore of Undeath). Maybe. But this is how it is worded. This section updates the rules for for how to pick an army for games of Warhammer, overriding any previous rules. All armies now use these rules for choosing an army. Oh yeah, good spot. I can see some positives, but in the end I reckon gamers can be trusted to use whatever rules they think leads to the best game for them. We see that in tournaments anyway, so I don't think it will change. I think it's reception will be similar to how 40k has been. Almost universal rejection but a fun option to be used to create narrative recreations etc. I'm most concerned that seeing it's rejection they make it the sole mode of army creation in future editions. They do love to tell us what we want instead of reacting to what we like.